Cis-1,2-dichloroethene (cis-DCE) and vinyl chloride (VC) were migrating off-site at this commercial facility. A pilot test of enhanced anaerobic bioremediation was performed to determine if a bio-barrier using 3-D Microemulsion, a form of HRC Advanced®, could effectively reduce the cis-DCE and VC contamination before it moved off-site. The remediation design included the subsurface injection of 3-D Microemulsion upgradient of contaminated well MW-9. Reductive dechlorination is a process used to degrade certain contaminants in groundwater (e.g., cis-DCE and VC) to ethene. 3-D Microemulsion is a highly effective agent to facilitate this process. 3-D Microemulsion is composed of free lactic acid, controlled-release lactic acid (polylactate), and certain fatty acid components esterified to a carbon backbone molecule of glycerin. 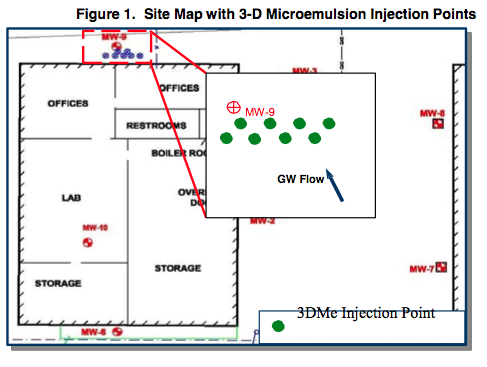 When injected into contaminated soil and groundwater, 3DMe produces a sequential, staged release of its electron donor components. The immediately available free lactic acid is fermented rapidly while the controlled-release lactic acid is metabolized at a more gradual rate. The fatty acids are converted to hydrogen over a mid- to long-range timeline giving 3DMe an exceptionally long electron donor release profile. This staged fermentation provides an immediate, mid-term, and very long-term controlled release supply of hydrogen (electron donor) to fuel the reductive dechlorination process. The objective at the site was to demonstrate the ability of 3-D Microemulsion to prevent the off-site migration of cis-DCE and VC by contaminant reduction. The reduction was to be achieved by the introduction of 3DMe into the subsurface through 8 injection points spaced 5 feet apart (Figure 1). 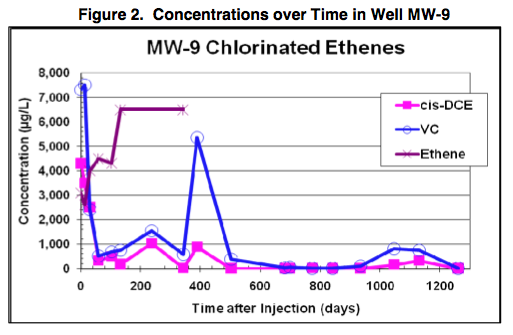 Overall, the results of this pilot test clearly show that when using 3-D Microemulsion, chlorinated ethene degradation via enhanced reductive dechlorination can be achieved both rapidly (60 days after injection) and successfully maintained over the long term.